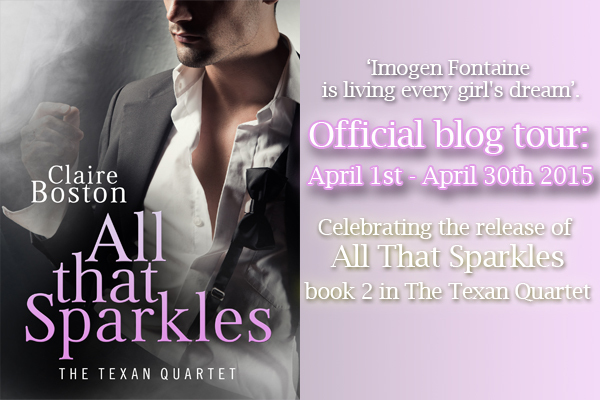 I’m so excited to introduce you to Christian Barker, the hero in All That Sparkles, Book 2 of The Texan Quartet. Chris, as he’s known to all of his friends, is a corporate lawyer, working his way up the ladder, trying to reach the top. His life revolves around work, making money and being a success. He remembers all too clearly the insecurity, uncertainty and poverty he went through as a teenager when his father lost his job. When Chris’s actions, caused him to lose his job. Though he’s overworked, he makes time to help his friend, Adrian with his wedding – which is when he is reacquainted with Imogen, his first love, and the girl who broke his heart and taught him not to trust. The following excerpt is from Chris’s point of view, just after he meets Imogen again. Chris let out the breath he’d been holding when Imogen walked out of the room. God, he hadn’t been expecting to meet her again, ever. The shock of seeing her, the instant delight on her face when she recognized him, had been so hard not to respond to. But he’d always promised himself he wouldn’t give her the time of day after what she’d done. After what her father had done. She hadn’t been. He’d thought she was a pixie when he’d first seen her up in her treehouse, all short black hair, tiny frame and a pink dress with jagged hem, the type that Tinkerbell and other fairies wore. “You sure made an impression on her,” George said. It appeared he had, and Chris didn’t know how to feel about that. He’d convinced himself she’d been playing with him, setting him up to get his father fired. The fact she would even acknowledge that time surprised him. Chris’s passion is for helping people, which he gets to do one day a month as part of his pro bono work for his company. He loves seeing his made a real difference in people’s lives and helping them with their issues. He’s a caring soul and if you check out the cover, you’ll see he’s hot as well! He makes suits look good. Imogen Fontaine is living every girl’s dream. She is a fashion designer for her family’s haute couture label, lives in a mansion, has a great circle of friends and is the apple of her father’s eye. Everything is perfect.